Abundant sunshine. High around 85F. Winds NE at 5 to 10 mph..
Robert “Bob” William Heine Sr.Robert “Bob” William Heine Sr., age 88, passed away on April 8, 2019, in Sarasota, Fla. He was born on Feb. 10, 1931, in Wauchula, Fla., to the late George F. and Jeffie Parrish Heine. 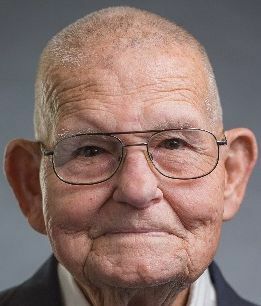 Bob loved his community and was a lifetime resident of Hardee and DeSoto counties. Bob was of the Baptist faith and a member of First Baptist Church of Arcadia. Mr. Heine was an exceptional person, a loving husband, caring father, grandfather, brother and friend and he will be missed by all who knew him. Bob was a graduate of Hardee High School, Class of 1950. After high school Bob served our country with the United States Army. When he returned from service he resumed his position with Coker Fuel, later moving to Arcadia and working for Gulf Life Insurance. Bob was a sharp-shooter in the service, so joining the sheriff’s department as a deputy was only natural. He would also serve as an Arcadia city councilman for over 20 years and held the position of mayor of Arcadia. Last but not least, many people will remember Mr. Heine as an associate of Ponger-Kays-Grady Funeral Homes. He would be the known face that would greet you at the door or be with you during the funeral of your loved one. He worked with us in the funeral industry for 39 years, and will be greatly missed. Bob’s favorite day of the week was Sunday! After church he and family would gather at his and Catherine’s home for Sunday dinner. His family meant the world to him. He enjoyed watching football and cheering on his Florida Gators. Bob was also a member of the Florida Sheriffs Association. He is survived by his loving wife of 68 years, Catherine Lowe Heine of Arcadia; four sons, Robert W. (Lois) Heine Jr., Ross (Marsha) Heine, Timmy Heine and Scott Heine, all of Arcadia; one sister, Mary St. John of Tifton, Ga.; 10 grandchildren and eight great-grandchildren. Bob was preceded in death by his parents and two brothers, George Heine and Pete Heine. A gathering of family and friends will be (Friday) April 12, 2019, from 5-7 p.m. at the chapel of Ponger-Kays-Grady Funeral Home, 50 N. Hillsborough Ave., Arcadia. Funeral services will be (Saturday) April 13, 2019, at 10 a.m. at the funeral home chapel, with the Rev. Ellis Cross of N. Hillsborough Baptist Church officiating. Burial will follow at Joshua Creek Cemetery, Arcadia. Online condolences may be made at pongerkaysgrady.com. Ponger-Kays-Grady Funeral & Cremation Services have been entrusted with the arrangements. Fred Hensley Jr.Fred Hensley Jr., age 74, passed away April 6, 2019, in Arcadia, Fla. Fred was born July 23, 1944, in Dayton, Tenn., moving to Arcadia 53 years ago from San Francisco. He had retired as a production manager for Orange County. He was an honorably discharged veteran of the U.S. Marine Corps having served in Vietnam. He was awarded the Vietnam Service Medal, Good Conduct Medal and the Rifleman (Expert) Medal. Fred enjoyed fishing, hunting and family cookouts. He was a member of Arcadia Moose Lodge #1327, the Arcadia Amvets Post 60 and the Arcadia Fraternal Order of Eagles. He was a member of the Baptist faith. Mr. Hensley’s survivors are his beloved wife, Beverly Hensley; one brother, Jerry (Maria) White; one sister, Linda Glass of Winchester, Va.; three step-children, David (Kristi) Sellers of Houghton, La., Traci (Dustin) Hicks, and Mindy (Jason) Basye, both of Sarasota, Fla. Fred is preceded in death by his parents, Fred and Laura Harwell Hensley Sr., and one sister, Nina Daughtrey. A Gathering of Family and Friends was April 8 at the Ponger-Kays-Grady Funeral Home chapel, 50 N. Hillsborough Ave., Arcadia. Funeral services and military honors will be at a later date. Online condolences may be made at pongerkaysgrady.com. Ponger-Kays-Grady Funeral Home and Cremation Services of Arcadia handled the arrangements.